Here we present all the EA Modelling tool vendors presently in the marketplace, with some basic information about both the companies and their tools. Adaptive creates simplicity out of complexity. Information, though routinely misaligned, remains the lifeblood of every organisation. It is essential today to know how critical data moves across an enterprise. Adaptive offers standards-based solutions that help organisations better align their valuable information by supporting specific management challenges including Data Governance, Data Quality, Metadata Management, Enterprise Architecture Management and IT Portfolio Management. Adaptive Enterprise Architecture Manager (EAM) is a robust MOF-compliant knowledge repository solution for organizing, integrating and analysing information about the key architecture elements of an enterprise. Adaptive EAM captures and monitors the full scope of enterprise architecture initiatives, enabling performance monitoring and enterprise governance on a holistic scale. Adaptive’s capabilities include the ability for “Intelligent Search” from the Microsoft suite of products where content is provided directly to those tools based on their security profiles. Adaptive also provides comprehensive capabilities for change management, versioning, workflow, and collaboration via our web based platform. The overriding needs to cut costs, to increase efficiency and to improve profitability are significant challenges in today’s economy. Adaptive EAM delivers significant benefits to organisations in addressing these issues. Adaptive provides a Business Excellence program allowing organisations to model and manage their EA initiatives. Archi has been developed by Phil Beauvoir, initially while working for the Institute of Educational Cybernetics and from 2013 onwards as an Open Source initiative together with the Archi community and users. We are now seeking funding and support from interested parties in order to continue development work. Archi is targeted toward all levels of Enterprise Architects and Enterprise Modellers. It is intended to provide a low cost to entry (i.e. free) solution to users who may be making their first steps in the ArchiMate language or who are looking for a cross-platform ArchiMate modelling tool for their company or institution. Archi fulfils the needs of most Enterprise Architects and associated stakeholders, but it can also be regarded as an introductory ArchiMate tool for those wishing to engage with the language before committing to a commercial solution. Since its introduction, Archi has been widely adopted for real-world use in the commercial and educational sectors and is used in-house by major global companies and consultants. It is rapidly becoming the de facto open source ArchiMate modelling tool. At Atoll we deliver agility into transformations. We have been developing SAMU, our transformation modelling tools since 2003. It stands out with flexibility, visual capabilities and ease of use. Customers range from Banking and Insurance to Government, Telecommunication, Industry, Utilities and Pharmaceuticals. SAMU offers almost all functionalities of the large footprint EA solutions and numerous exciting unique features at a fraction of implementation time and resources. avolution provides the market leading ABACUS solution for I.T. strategy and enterprise architecture. ABACUS is recognized as the #1 EA tool in several independent tool assessments and as a ‘leader’ by the analysts. avolution has offices in Europe, Asia-Pacific and the United States and together with their global partner network services an ABACUS user-base of several thousand users in over 100 countries. ABACUS is quite simply the most flexible, feature-rich and easy-to-use I.T. strategy, planning and enterprise modelling tool on the market today. What can take months with other tools (if it is possible at all) can be done in minutes with ABACUS. ABACUS was the first tool certified to support PeaF and through simple drag-and-drops in the standard user interface it supports over 100 other frameworks and notations including ArchiMate, BPMN, BMM, UML, TOGAF, DoDAF, MoDAF, NAF and FEAF. The rise of a digitally savvy populace increases the pressure on your organization to deliver products and services that meet the digital expectations of your audiences. Therefore, a clear vision on the alignment of strategy, technology, processes and people within your organization is key. To become successful in the digital age a powerful business design is crucial. That’s why we have developed BiZZdesign Enterprise Studio, our collaborative software platform that transforms the way you design your digital business. BiZZdesign Enterprise Studio is a collaborative business design platform that enables the continuous innovation, transformation, and management of the digital enterprise, using shared descriptions of business models, investment portfolios, and business, application and technology architectures, in order to exceed customer expectations, improve productivity, shorten time to value, reduce risk, and create competitive advantage. · BiZZdesign Enterprise Studio is a flexible, easy to use collaborative business design platform that enables clients and partners to create new solutions that easily integrate with and adapt to their environments. · BiZZdesign Enterprise Studio has powerful analysis and visualization capabilities enabling the who, what, where, when, and why questions to be asked and answered with meaningful charts, graphs, tables, dashboards, and reports. · BiZZdesign Enterprise Studio supports senior management and line-of-business owners in their quest to drive continuous innovation, transformation and management of their organizations into next generation digital enterprises. · BiZZdesign Enterprise Studio supports the operational needs of organizations by empowering them to plan, track, and communicate change - more rapidly, more reliably and with less risk. BiZZdesign Enterprise Studio gives excellent support for the core capabilities for an EA tool (repository/meta model, modeling, decision analysis, presentation, administration, configurability, frameworks and standards, usability). Enterprise Studio also provides substantial and differentiating support in the areas of innovation, visualization, mapping and modeling, analysis and design, time to value, and business architecture design, and offers unique capabilities e.g. for risk & security and business strategy. BiZZdesign Enterprise Studio is often selected as the tool of choice because it is very easy to use, has powerful visualization features, appeals to both business and IT stakeholders in an intuitive way, supports best of breed frameworks, provides accelerating best practices and reference models and is easily extendable to map adjacent information. BOC Information Technologies Consulting GmbH was established in 1995 in Vienna as a spin-off from the Department of Knowledge and Business Engineering at the University of Vienna. Through its international orientation and customer centric strategy, new branch offices in Berlin, Madrid, Dublin, Athens, Paris, Warsaw and Winterthur were established to support clients locally. Today BOC can count many and varied Enterprises as customers on all five continents. All our customers are individually supported based on their native language by experienced consultants and partners. ADOIT is the flagship enterprise architecture tool by the BOC Group. With ADOIT, the BOC Group provides professionals with an easy-to-use, intuitive and TOGAF®-compatible tool for enterprise architecture. Compelling features, such as the different role-based dashboards, make the tool interesting for architects as well as C-level executives and non-EA roles. The BOC Group provides customers with other frameworks and notations such as, PEAF, ArchiMate, etc. The Meta-modelling concept of the BOC Group allows customers to build their own individual framework or adapt frameworks, such as TOGAF, to their needs. Besides enterprise architecture management, ADOIT is also used for IT Service Management and Governance, Risk and Compliance. EA buyers, consultants, alumni, students can download the free version of ADOIT, namely the ADOit:Community Edition (www.adoit-community.com) to become familiar with the many features of the tool. On the ADOIT:CE website users will find instructions on how to download and quickly set up ADOIT:CE. They can join the ADOIT Enterprise Architecture forum on LinkedIn to ask questions and discuss trending EA topics with other professionals. Change is a constant. Today, change happens faster than ever. Many kind of initiatives constantly take place to change the organization. If your organization is complex, visualizing the complexity and transforming it in response to external pressures is difficult. Enterprise Evolver gives you a clear picture of your organization at any given point in time about your enterprise. This makes it easier to understand how best to respond to change. Capability Management is a digital company headquartered in Latham, New York (USA). Capability Management provides innovative and intuitive digital app that support enterprise evolution. It is an app to comprehend and present holistic view of enterprise through network graph database and intuitive user interface on mobile iPad device. With Enterprise Evolver, you can map Customer Journeys, Strategy, Business Capabilities, Processes, People, Services & Application Systems and understand how all parts of the enterprise fit together and relate to each other to deliver value to your customers and generate revenue. · Model business parts, their connections and flow. · Understand impact of change before a change is affected. · Visualize and understand how value flow within your organization and work is accomplished. Visualize - Seeing is believing. Casewise allows you to document any aspect of your business, from high level strategy through process and IT infrastructure - quickly and easily. Expand - Communication & collaboration are essential. Casewise allows you to share and collaborate with all parts of your organisation, from core team members to senior executives. Optimize - Adaptation is vital. Casewise enables you to analyze, plan, improve and monitor how you do business. From integrating with a CMDB to process analysis and automation, Casewise solutions allow you to live and thrive in the business ecosystem. The Casewise Suite provides the integrated, adaptable, and flexible framework you need to align your IT and business strategies to obtain desired business outcomes. Casewise’s featured EA solution Evolve leverages social communication technology to enable collaboration that delivers true end-to-end best practices, governance and compliance driven process improvement within your enterprise, so it becomes part of your corporate culture and DNA. Casewise solutions leverage the collective intelligence of your workforce and enable successful collaboration across organizational silos. Casewise helps identify problems before they become major risks and in turn facilitates the discovery of valuable opportunities. Casewise truly does deliver a 360 ° view of your enterprise. Casewise Evolve build on the foundation created by Casewise Modeler. Casewise Modeler enables your organisation to better understand what you do, how you do it, who does it, why you do it, when you do it, where you do it, and what’s needed to do it. Information stored in the Casewise central repository allows you to develop better insights to make better decisions to optimize your organisation’s performance. That means gaining efficiencies, saving money, increasing agility, mitigating risk and delivering better customer experiences. By linking together strategic, organisational, process, IT architecture and data technology modeling through dynamic object linking, the Casewise Suite enables teams to capture and understand the relationships and interdependencies between the organisation’s people, processes and technology. The main users of Dragon1 are architects and managers. Also business and information analysts, process designers, consultants, program - and project managers, service managers and project workers. Their created architectural products are used to support decision-making by Board and management. Also Dragon1 Inc. develops and maintains the body of knowledge of the open Dragon1 EA Method. Dragon1 is a registered trademark and brand. Dragon1 is an online collaboration platform enabling people and organizations to do enterprise innovation in a visual and effective way. Dragon1 is used as innovation lab, with access to a BPM Tool, EA Tool, UML Tool, Project Management Tool and GRC Tool. Business professionals design concepts, innovations and business models on Dragon1. And with that they create new and improved products, services and solutions for the organization. In fact with Dragon1 they are building their SMART DIGITAL Company. SVG is used as open the vector graphics language for creating models. We recommend to use Dragon1 in a SVG-compliant browser for interoperability purposes and graphics performance. Dragon1 can be used with Safari, Google Chrome, IE9+ and Firefox. · Digital Workplace - is an online digital workplace to do your basic office automation work, task management, work management and messaging with fellow users in your account. You can share your created documents, plan tasks, check your calendar, write blogs, startup applications and send and receive messages. · Resource Center - is an information policy web application providing architects with editable checklists and templates, design strategy, glossary of terms, a set of strategic baseline documents about the companies way of working with architecture. · Architecture Repository – is your own architecture CMDB tool with which a user can create, administrate, store and manage storage data and information in the form of entities, adjustable to the user. Entities, classes, attributes and types can be created and edited, also relationships can be created between entities (i.e. modelling). · Visual Designer - is the drawing tool in which you create your visualizations based on views, perspectives, models and meta models using layers and time-frames. You can create a visualization and change, at once, all the symbols to a different drawing style: sketch, drawing, diagram (wireframes) and photographic images. · Models Atlas - is the web application for making design books: your visualizations interactive and publishing them to the outside world. Not every visualization you create in the Visual Designer you want to be accessible by everyone. In the Models Atlas you can work with real time data-indicators and pop ups and you can have users leave notes on the atlas pages. · Catalog - can be used to create catalogs, like an application catalog or process catalog. This comes in handy if you want to enter large amounts of data (number of attributes) for an entity-type. · Application Manager - is the maintenance application: Technical management, Application Management and Functional Management all can be done role based using this web application. Dragon1 works with Role Based Access Control (RBAC) and allows for integration with the companies identity management solutions. Dragon1 can be used as SaaS, IaaS and PaaS. You can have a Dragon1-database on the web or at your own premises to use with the software. The Essential Project is a powerful, professional, proven and free of charge Enterprise Architecture toolkit, available for download from www.enterprise- architecture.org. The goal of the project is to promote the value that EA can bring to organisations of all sizes and experience, lowering barriers to entry with a set of free, simple, productive and effective tools. The project is not only about the tools. It is building a community supported by the tools and aims to provide a useful, active forum for sharing ideas and experiences of applying EA practices to real world business. The Essential Project is created and sponsored by Enterprise Architecture Solutions Ltd. www.enterprise-architecture.com. The Essential Project takes its name from the focus on providing those capabilities that are "essential" to maximising the value of enterprise architecture; helping organisations manage and analyse the knowledge needed to make decisions that impact or are impacted by the enterprise architecture. Built by architects, for architects, Essential Architecture Manager is the reference implementation of the Essential Meta-Model (the open-source, framework- independent ontology for EA). Essential Architecture Manager consists of Essential Modeller and Essential Viewer, which separate the capture of information from the analysis to bring class-leading management and visualization of your enterprise knowledge. A powerful multi-language framework for both the modeller and viewer, data import/export capabilities and a continuously-developed Essential Meta Model means that Essential can rapidly import your data from your existing sources, capture and manage more details of your enterprise architecture and dynamically produce views of your data, in your language. From managing regulations and compliance, strategic roadmaps, project and programme impact and progress, to detailed visualisation of the application and infrastructure, the over 500 meta classes in the Essential Meta Model provide the richest and extensible platform with which to capture and manage any aspects of knowledge about your enterprise. Central to web-based Essential Viewer is the ability to rapidly provide insights and support for a wide range of stakeholders - in particular for those from the business and outside of IT and architecture - in formats and terms that make sense to them immediately. Real world application of Essential Architecture Manager combined with shared experience of the Essential Community continues to direct the development of Essential, focussed on an enhanced and powerful platform for managing your Enterprise Architecture. We support companies in integrating ICT with their business to create value. Our offering of consulting services on strategy, architecture, organisation and governance of systems allows companies to align Business and IT processes with their strategic goals. The experience we have gathered in all the different market sectors has been formalized in a rich set of frameworks and analysis tools, that enable the quick and reliable delivery of consulting projects. MappIT is an easy to use tool designed to manage an IT Strategy, Governance and Architecture based on our MappIT model. Ever wished for an ‘EYE’ into your business - providing unlimited visibility? Enabling you to better "Envision Your Enterprise" has been our goal since 1985. Over the years we have evolved a highly adaptable and user-friendly enterprise repository supporting both technical and business stakeholders. Our highly collaborative and secure ENVISION® VIP system provides powerful and truly unique tools for visualizing, analyzing, leveraging, and synergistically sharing any and all types of enterprise information. · “Envision in your mind” a truly adaptable and visual computer-aided enterprise! · “Envision a normalized, secure, fully leveraged enterprise repository! · “Envision secure multi-user support with unlimited stakeholder views! Fully empowering your enterprise information is our goal! ENVISION VIP® intuitively lets you visualize and leverage all types of enterprise data. Any number of "stakeholder views" including any desired "Business Objects" can easily leverage and share useful enterprise "attributes". Today’s enterprises are striving to better coordinate and link strategic planning, enterprise resource & asset management, service function identification, risk management, change management, process modeling & renewal. Typically, the myriad systems & files associated with these activities are sent to various “Document Management Systems” [Museums of files?] or perhaps into a state-of-the-art “Cloud”. Independent word processing, spreadsheet/DB, and graphic programs with little or at best file-level connectivity preclude referential integrity and true information leveraging. ENVISION VIP® securely supports the intuitive “Normalization” and “Synergistic Sharing” of your vital enterprise information. Unlimited “Visual Portals” enable various business stakeholders & analysts to identify, manage & track complex interactions and fully leverage all vital enterprise information. Goals, capabilities, business rules, processes, services, functions, associated risks, KPI’s, and metrics can all be easily linked and tracked. Information can be captured at the earliest useful point and referential integrity easily maintained & leveraged throughout the organisation. Security, access control, risk analysis, change notification, and change history management are all supported. Powerful reporting capabilities provide timely and intuitive insights into these vital enterprise resources. Dynamic dashboards can to setup to alert various stakeholders of changes or risks requiring their attention. Automated web site creation allows sharing of selected repository views with various authorized stakeholder groups. Multiple intranet sites can be easily maintained for various groups. Envision supports multiple frameworks [including PEAF, TOGAF/ArchiMate, Zachman, DODAF, and many others] and allows new views to be added as desired with no need for any vendor modifications, coding, or scripting changes. Linkages between models from any of these frameworks can be easily added as desired. More info: www.future-tech.com . Holocentric software, helps organisations to operationalize strategy, manage business transformations and achieve operational excellence by providing a business management system and enterprise architecture tools that helps them capture, understand, change and optimize their business - from strategy, people, programs and procedures to compliance obligations. Holocentric software stores information in a single location and makes it easy to personalize and distribute views of the business to employees, based on their job. Modelpedia is the award winning platform* for implementing model-based collaboration and model-based communication. Modelpedia is a Model repository designed to store models created in Holocentric Modeler 7.1. In addition to this Modelpedia is a web portal for publishing those models as well as providing various related collaboration and portal features. Holocentric Modeler is a modelling tool for building rich business and architecture models about your people, processes and technology and how they interact to produce value. You can use Holocentric Modeler to model business processes, your technology systems, or you can use it to map the relationships between people, process and technology. At every level of your business, the model becomes like a map that shows where you are, where you want to go, and how to get there. Because you can flexibly describe and associate “entities”, such as people, processes or systems, you can choose how to apply the modeling tool to your business. Essentially, you can model any item or thing in your business and define relationships between any of these. UNICOM® Systems, Inc. is a global information technology company delivering world-class solutions for the enterprise computing marketplace. Our extensive client portfolio includes Fortune 500 and Global 2000 corporations, and federal, state and local government organizations who use our end-to-end solution suites and software across the globe. UNICOM® System Architect® is a market-leading enterprise architecture tool that enables you to build and automatically generate data-driven views of your organization's enterprise architecture -- its strategy, business architecture, operational architecture, data, application landscape, supporting systems, technologies, and infrastructure. iGrafx is a ‘Gartner recognised’ leading provider of Enterprise Architecture, Business Process Analysis and Management solutions that help Enterprises achieve competitive advantage through process visualisation and excellence. The iGrafx solutions enable Enterprises to define and link the Enterprise Architecture to the Business Process landscape enabling full visualisation and Impact analysis. This will ultimately lead to: increased customer satisfaction, reduction of costs, improved quality and increased resource utilisation. An Enterprise wide modelling and management tool suite enabling all necessary Artefact Modelling. This will enable full alignment of company processes, resources, RACI, and systems with corporate goals and strategies. It enables compliance management, risk management, enterprise architecture, quality improvement initiatives and any required KPI. Through data integration and visual workflows, Enterprises can develop comprehensive Enterprise models with multidimensional views of business processes, supporting systems, technology components and resources (RACI). In addition, Performance Central - provides real-time Process Performance Monitoring and ‘Dashboard’ reporting. An Enterprise wide solution enabling Process-oriented behaviour and measurements to be captured in real-time in relation to business strategies and goals. Reports and displays intuitive and meaningful business critical information to executives adopting a Process Performance Management approach. These displays are entirely customisable to the end users’ viewing requirements and preferences. We want to combine the best of engineering, innovation and design. Our goal is the creation of innovative software products that appeal to global audiences. We are a team focused on delivering innovative software solutions by leveraging emerging technologies and trends. INARTEC is the place where engineering, design and innovation is real. idungu is a BPA Tool + Enterprise Architecture Model + Social + WES (Web + Easy & Simple). Idungu is a unified vision of the how the company works and how it relates. With idungu, everything is connected. Inspired provides consulting services, training and tools to support organisations in achieving desirable futures. Focus includes strategic planning, business and IT alignment, Business and Enterprise Architecture, Digital Transformation, Initiative Management and Delivery methods. Training on TOGAF, Other EA methods, business, information, process and application architectures. Consulting services at senior level. EVA Netmodeler is an innovative web and repository based collaborative enterprise modeling and knowledge management tool. It supports the work of strategists, enterprise architects, portfolio and programme managers and others in defining and realizing enterprise strategy. · Complete meta model flexibility - alter at run time with automatic adjustment of forms, browsers, reporting etc. Intelligile is a pioneer in the area of Business Excellence. Intelligile defines Business Excellence as the ability of an organisation to provide the maximum value to its stakeholders, which requires a continuous understanding of its surrounding landscape, ability to envision the future, set a winning direction and quickly and intelligently align itself to achieve its objectives. The company develops methodologies and tools that cover all aspects of Business Excellence Life cycle. It provides an integrated methodology for complete round-trip planning from strategy to implementation and capabilities building. Intelligile MAP™, which stands for Model, Analyze and Publish, is a comprehensive and powerful modeling solution for developing a complete Knowledge Maps for an organisation. It is the ideal tool to integrate, the most elaborate support for Enterprise Architecture, Business Landscape, Strategic Planning with Business Motivation Model and Balanced Score Cards, Operation engineering and BPMN, IT Architecture with TOGAF9 and Archimate, Service Model, Business rules, Roles management, Business Automation framework, Competency Framework with skills and responsibilities, Organisational Structure, Strategic Brand Management, Organisational Culture Management, GRC (Governance, Risks and Compliance), and Organisational Project Management with Prince II, OPM and P3M3 as well as DoDAF. The solution supports the full life cycle of modeling, communicating and publishing, monitoring implementation of planned Knowledge Maps, measurement, performance and evolution of models. Based on technology that mimics the functionality of the brain, the tool is natively Meta-model driven and come with a very rich of model types that cover all aspects of an enterprise. The Meta-models are fully customizable and expandable. iteratec is appealing to top talents. Last year we were awarded Great Place to Work & Bayerns Best 50 awards. We are a dynamic enterprise. You’ll find us easy to work with, and good at taking quick decisions to move your project forward. iteraplan 5 – the amazing Enterprise Architecture Management Tool – is a new product that combines tried and proven concepts, methods and experiences from past releases. It is based on the best-practice EAM method developed by iteratec from experience gained in a multitude of projects. With its central repository, intuitive web interface and powerful reporting capabilities, iteraplan is an effective solution for documenting, analyzing and planning the enterprise architecture. iteraplan delivers support on all fronts to help you with starting and embedding EAM practices in your company. Link Consulting was created at the end of 1998 as a company with clearly marked innovative characteristics, congregating nowadays about two hundred highly qualified and motivated collaborators, with a vast knowledge of the market and its companies. Since its creation Link Consulting has been a differentiating factor in the Portuguese society, reaffirming it is possible to create wealth in the national territory with Portuguese people, Technology and Innovation. EAMS was created as a result of research over a decade in the attempt to solve the fact that manual diagrams tend to required too effort to be kept up-to-date over time, thus leading to the abandon of Enterprise Architecture projects. Thus in EAMS all diagrams are generated on-the-fly based on information gathered from multiple repositories/tools, Manual diagramming is an external task that can be done in external modelling tools and then imported into EAMS. Thus EAMS does not provide you a graphical modelling interface as information input. Another aspect is that in EAMS all generated diagrams have a time slider, so one can see the contents of that diagram to change over time according to the planned or occurred changes. The result is that in EAMS, the faster the organization changes, the easier is to keep the Enterprise Architecture up-to-date, since it is fuelled by change plans, that can be be expressed in a collection of models they be in BPMN, UML, Archimate, of in textual data (eg Excel) or both. MEGA helps organizations manage enterprise complexity. In a fast-paced and disruptive business environment, organizations must be forward-looking and agile to adapt to rapidly-changing markets, technologies, and regulatory requirements. MEGA offers them powerful solutions for managers to make the right decision, govern their operations and strike the right balance between innovation, cost, and risk. Through a fully integrated set of software solutions called HOPEX – coupled with consulting services that have been recognized by customers and industry analysts for years – we help organizations address corporate governance challenges and implement successful IT strategy delivery and digital transformation programs. MEGA’s innovation is driven by customer success in achieving their business goals. And MEGA is proud to have earned a loyal customer base spanning over 40 countries. No matter where their company operates, customers will find a MEGA office or a trusted partners near to support their business development. MEGA has operations in nine countries across North America, Latin America, Europe, North Africa, and Asia, as well as 20+ business partners around the world. MEGA’s HOPEX solutions, powered by a single integrated platform, bring together industry-leading best practices in enterprise architecture (EA), business process analysis (BPA), IT portfolio management (ITPM), and governance, risk, and compliance (GRC). The platform offers an easy-to-use, collaborative, multilingual workspace backed by a single repository. Users access the platform through a unified, role-based, web browser interface that provides just enough of the tools, information and reports they need to be effective and ease decisions. They receive support and guidance at every step of their programs through the platform’s services, repository administration, and technical configuration capabilities. 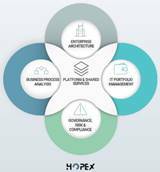 The HOPEX platform wrong-foots the “best-of-breed” approach to enterprise architecture tooling in the digital era: it fosters synergies and collaboration across silos and allows the enterprise architect to easily reach new audiences, while speaking the language of the business. Every user can work towards the same goal to support the organization’s strategy and focus on delivering business value. MooD International is headquartered in York, UK, with additional UK offices in London and Bristol. With its MooD software platform, the company works directly and through partners to deploy customer solutions that improve performance of large, complex, information & people-intensive missions, programmes and service portfolios. MooD-driven solutions drive business outcomes by providing transparency and control to inform and evidence decision making for improved transformation and delivery performance. Achievement of outcomes is evidenced through gains in deployment of cost and capital. The Company’s direct customer base extends across the UK, EMEA and USA. It achieves global reach through alliances with a number of major industry players who integrate the MooD platform into their own market offerings to deliver business model-enabled solutions, extending their market reach and strengthening their business portfolio. In recent years MooD solutions have been instrumental in delivering efficiency gains and savings to the tune of hundreds of millions of pounds to the British Government and to the economies of major enterprises. It provides solutions to the defence, central government, commercial sectors, national security communities and to other sectors via industry alliances. MooD is an architecturally-driven software platform that enables MooD International, its partners and customers to rapidly configure solutions to address business problems specific to an industry or an individual organisation. In each case the key objectives are to improve transparency and dialogue about business performance, to allow investment-level decision making to be connected through into operations, and to make the 'ropes touch the ground'. A MooD solution is driven by an Enterprise Business Model that captures domain knowledge of the moving parts of an enterprise, in terms of what really drives what in a business - a dynamic, layered, risk-focused model that accommodates both human judgement and hard data. The causal and probabilistic algorithms in a MooD Enterprise Business Model capture understanding about how a business should or could be working, and enable a ‘trade and balance’ approach to decision making. This decision process, including how best to respond to priority issues, either in the near term (hours, days) or longer term (months and years), so as to retain alignment with target outcomes. One of the most respected providers of standards-compliant modeling, simulation, and analysis offerings in the industry celebrates its 15th year anniversary. No Magic’s Cameo™ Suite includes support for modeling (people, business, processes, systems, systems-of-systems, hardware and software), requirements management, enterprise architecture, simulation and model execution, data modeling, parametrics, compliance, testing, asset management, model driven architecture, code generation, reverse engineering, documentation and publication, and systems modeling. The Cameo Suite with award-winning, OMG® standards-compliant products allows users to efficiently model organisational structure, business processes, compliance, applications, information and technology. MagicDraw® supports multiple domain-specific models based on UML® including: BPMN, SysML, DoDAF/MODAF/UPDM/UAF, MDD, SOA, unit testing, data modeling and more. Professional services include training, consulting, custom applications and MagicDraw® product customizations such as custom modeling domain diagrams, requirements management, team collaboration, design and analysis. No Magic, Inc. is headquartered in Allen, Texas with operations worldwide. The company’s flagship, MagicDraw encompasses a wide variety of offerings spanning from model-based UML drawing tools (Personal Edition) to the team-based software design environment featuring code, engineering, model transformations and visual differencing (Enterprise Edition and Teamwork Server). MagicDraw® supports multiple domain-specific models based on UML® including: BPMN™, SysML™, fUML, DoDAF/UPDM/UAF, MDD, SOA, unit testing, data modeling, simulation and activity-based model-driven costing. OpenText (NASDAQ: OTEX, TSX: OTC), founded in 1991 with 2012 revenues of US$1,207.5m is the leader in Enterprise Information Management (EIM). EIM enables organisations to grow their business, with lower costs of operation, and reduce information governance and security related risks. OpenText focuses on the key drivers of business success to improve business insight, strengthen business impact, accelerate process velocity, address information governance and provide security. OpenText is unique among its peers in providing leading solutions for Architecture, Business Process Management, Enterprise Content Management and Customer Experience Management. OpenText ProVision is a market leading business architecture, process modeling, and analysis tool providing the ability to discover, model, analyze, and optimize your business enabling you to make smarter decisions when considering changes or the impact of change on your organisation. With OpenText ProVision, both business and IT personnel can work seamlessly together to create rich models, supporting initiatives such as mergers and acquisitions, business transformations, ERP implementations and upgrades, process excellence and Enterprise Information Management. The ability to take the guesswork out of business change and process improvement plans by performing a thorough analysis of proposed changes before they are implemented helps to minimize risk and ensure faster time to value. OpenText also offer an expanded collaboration server and repository - OpenText Knowledge Exchange provides an extended ability for larger teams of OpenText ProVision users to work together. OpenText Knowledge Exchange also enables users to build, manage, update, share and collaborate on OpenText ProVision models via the web - enabling globally-distributed teams to work together on a common, model-based view of their enterprise. It is designed to better support the scalability and productivity challenges encountered by large architecture programs, which often need to support thousands of users. (OpenText Knowledge Exchange is not required for individuals or smaller teams, where the inbuilt OpenText ProVision repository is generally sufficient). Headquartered in London, and founded in 2004, Orbus Software is an independent software vendor and a leading global provider of software solutions for Enterprise Architecture, Business Process Analysis and Application Portfolio Management. iServer is an easy to use, collaborative enterprise modeling environment that extends and enhances the Microsoft Office and Visio products. Core components include Microsoft Visio as the diagramming interface, a powerful central repository for all enterprise architecture or business process models and documentation, and a range of tools for presentation, analysis and decision making. Pragmatica Innovations (PI) creates more efficient and profitable enterprises. Unlike companies that start by managing documents, improving processes or building software - our team begins with the foundations of these solutions. We provide a complete understanding of the information that builds the requirements for successful and robust business capabilities. Using the doctrine of pragmatism, our team applies architectural rigor to all its solutions. It makes no sense to try to improve, using new expensive tools and software, what is fundamentally flawed – bad information. Information is the tool of management decisions and world-class operations. Our products and services are built based on how information is generated, transformed and shared in an organization. Within every solution is the same persistent information built into a strong architecture that can survive organizational change, new requirements and products, even mergers and acquisitions. New programs and procedures do not fail by themselves. They fail because they are hastily built without a full understanding of what they are supposed to do. With a solid understanding of the information that must be managed we can improve business management services, create collaborative environments, provide ways to visualize complex information that help make objective resource decisions and show how information becomes data and data becomes decisions. We are confident because we have created a complete approach (the 42 way). We designed and integrated frameworks (42 framework) to capture the information; developed a tool (DE2M) to model it both visually and within a database; pioneered methods to generate solution requirements from repeatable models and synthesized a complete business management model and platform (PrISM) that integrates the software investment you have already made. We continuously strive for the most practical means to accomplish our work! We work with each customer and partner to ensure their self-sufficiency - always including our unique ethical perspective on contributing to an environmentally sustainable future. DE2M is an enterprise level modeling solution that integrates Microsoft Visio with a relational database to “data enable” your diagrams. Use Microsoft Visio to model information such as business processes, network diagrams, system architecture, facility architecture, or organisational constructs and consolidate this information, analyze, manage, and control it using DE2M. View and edit the combined information and diagrams online through a security-controlled central web accessible repository or take your data offline to work in an isolated environment and then synchronize back to the repository later. Full support to model and analyze all enterprise architecture frameworks with the power and extensibility of customizing attributes and adding new objects entirely. DE2M comes with many stencils to get you started and we also sell stencils for DODAF 1.5, DODAF 2.0 and more. Go from existing data to diagrams with the ability to import several formats of Microsoft Excel worksheets and other data and then use DE2M’s powerful and customizable Auto-Draw feature to meet the modeling methodology of frameworks or even fit for purpose modeling rules that you can define. QPR Software Plc (Nasdaq Helsinki) provides solutions for strategy execution, performance and process management, process mining and enterprise architecture in over 50 countries. Users of QPR Software gain the insight they need for informed decisions that will make a difference. With 25 years of experience, 2 000 customers and over a million licenses sold, QPR’s products are highly regarded by industry analysts and customers alike. All organizations have operations consisting of people, processes and IT systems. Smart organizations improve their operations, and the smartest ones do it with QPR EnterpriseArchitect. When you need to be faster in an ever changing environment, QPR EnterpriseArchitect helps you gain the capabilities needed to analyze, plan and improve your business. Intuitive and easy to use, both business and IT users prefer QPR EnterpriseArchitect to help them ensure that operations are aligned with strategy. · Professional enterprise architecture, easy process modeling, analysis, ABPD (Automated Business Process Discovery), and performance management in one modular product suite. All products have an open metamodel and integrated methodology, and they support both logical level modeling and monitoring of actual performance. · Web-based collaboration portal makes enterprise architecture available to everyone, supporting interactive contribution and involvement in the actual context (action management with workflow). Embedded analytics allows discovery of usage patterns and volumes. · Microsoft Office compliance: user interface look & feel and out of the box integration with Microsoft Excel, PowerPoint, Visio, Word and SharePoint. Modeliosoft (www.modeliosoft.com ) provides enterprise solutions based the limitless modelling capacities of Modelio. Modelio is developed and maintained by Modeliosoft. Based in Paris, France, Modeliosoft provides training and consulting in EA, BPM, IT, software modeling and MDA tool customization to adapt Modelio to specific contexts and organisations. Its international support team and its network of partners can help make a project successful throughout the world. Modeliosoft is (100%) part of the SOFTEAM group (920 engineers). Modelio is the result of 22 years of experience in modeling, methodology, and case tool architecture. Modelio has been designed to make modeling a pleasure, through its efficient ergonomics, its built-in consistency checks, its internal MDA capacities and its model management features supporting the organisation of large-scale distributed models for large distributed teams. · On the shelf TOGAF modeling support. MODAF, DoDAF and NAF support. · Federated repositories support, enabling Enterprise architecture modeling across federated enterprises, independent BUs, or enterprise ecosystems (partners, customers, …). Distributed repositories allow an open access and referencing between repositories (similar to the WEB). This World Wide Modeling technology is unique on the market. · WEB based administration, stakeholder’s roles management, federated repositories management. View configuration per role, project portfolio management. · Integrated support of UML, BPMN, TOGAF, standard. Archimate alignment. · Global traceability and impact analysis support, from goals and requirements to solution modeling. · Customizable document generation: MS Word, WEB/HTML, Excel. Software AG empowers customers to innovate, differentiate and win in the digital world by offering the world’s first Digital Business Platform. This service-oriented and event- driven platform enables modernization of existing systems, consolidating them on-premises and in the cloud into a single platform that optimizes businesses and delights customers. With Software AG, organizations can rapidly build and deploy digital business applications to exploit real-time market opportunities, get maximum value from big data, make better decisions with streaming analytics, achieve more with the Internet of Things, and respond faster to shifting regulations and threats with intelligent governance, risk & compliance. Building on over 40 years of customer-centric innovation, the company offers solutions that are vendor-neutral and deliver faster time-to-value by combining proven products, process blueprints and fast implementation paths to address vertical and horizontal business needs. It is therefore ranked as a “leader” in more than a dozen market categories by the industry’s top analyst firms. The Digital Business Platform is built of best-of-breed product families: Adabas-Natural, Alfabet, Apama, ARIS, Terracotta and webMethods. Software AG has more than 4,400 employees in 70 countries that serve 70% of the Fortune 1000. The company was founded in 1969 and is headquartered in Germany. Alfabet is a high-level, out-of-the-box, cloud-capable and mobile-enabled application service of Software AG’s Digital Business Platform. It helps IT decision-makers make better IT investment decisions and reduce transformational risks by understanding when, where, how and why to make changes in the IT portfolio. It links the interdependent perspectives of IT, business, finance and risk for “whole view” analysis of how IT can support business change. Enterprise architecture capabilities build the necessary foundation with an accurate, real-time picture of the IT landscape - including all applications and technologies, the inter-relationships between them, the information they exchange as well as the business capabilities and processes they support. Alfabet’s portfolio management capabilities support independent portfolio decision-making for optimization of individual portfolios as well as portfolio-level strategy modelling to incorporate all portfolios into strategy formulation. Its collaborative planning platform enables all stakeholders to interface, communicate and consider multiple perspectives when making transformation decisions as well as prioritize project proposals based on alignment with business strategy. With customers in industries ranging from aerospace and automotive engineering to finance, defense, government, entertainment and telecommunications, Sparx Systems has won seven consecutive SD Times awards and is the leading vendor of innovative solutions based on the Unified Modeling Language (UML) and its related specifications. A Contributing Member of the Object Management Group (OMG), Sparx Systems is committed to realizing the potential of model-driven development based on open standards. The company's flagship product, Enterprise Architect, has received numerous accolades since its commercial release in August, 2000, including two Jolt and Visual Studio Magazine Reader's Choice Merit awards. Now at version 12, Enterprise Architect is the design tool of choice for over 380,000 registered users world-wide. Enterprise Architect is an award winning visual platform for designing and constructing Software, Business and Real Time systems. Enterprise Architect is ideally suited for describing the structure of an enterprise, with support for leading architecture frameworks including TOGAF, UPDM and Zachman Framework. Describe organisational structure and management controls, develop strategic models, compare changes to established baselines, visualize hardware deployment, optimize business processes and create a shared vision of the enterprise using a team based, collaborative modeling tool. As the market leader in enterprise application software, we help companies of all sizes and industries run better. From back office to boardroom, warehouse to storefront, desktop to mobile device - SAP empowers people and organisations to work together more efficiently and use business insight more effectively to stay ahead of the competition. SAP applications and services enable more than 248,500 customers to operate profitably, adapt continuously, and grow sustainably. Take charge of change with collaborative, model-driven architecture and design. Visualize, understand, and manage the impact of change to your enterprise system before it happens - with SAP Sybase PowerDesigner. This end-to-end tooling software supports model-driven architecture (MDA) design with industry-standard modeling techniques, a powerful metadata repository, and unique link and sync technology - so you can respond to change with confidence. Troux helps the world’s leading commercial and government enterprises make better decisions, faster. Using Troux, business leaders can connect business context to IT and gain new levels of visibility and management control over key areas of their business. Troux delivers transparency that empowers business leaders with a real-time view into the IT assets spread across their company. Troux-powered data visualizations and analytics illustrate how IT supports corporate goals, strategies, and core business processes. The result: business leaders better understand which IT assets are needed to function, operate and grow their business, and make well- informed investment and divestment decisions. Troux’s suite of Enterprise Portfolio Management (EPM) products help business leaders make more informed decisions that lead to reduced costs, decreased risk and improved agility by ‘connecting’ business context to IT. Troux EPM products help decision makers gain valuable insights into the key portfolios (areas) that characterize a business. This transparency delivers executives with a clear, real-time view into their assets (tangible and non-tangible) and illustrates how and where they are used across their business. With Troux decision makers are able to quickly see how these assets support corporate goals, strategies, and core business processes. The result, business leaders have the ability to better understand which assets are required to operate and grow their business and which are not; and decisions that affect the business can now be consistently made on facts rather than opinions. · Contains a best-in-class Meta-model that characterizes a business by organizing and connecting key data elements into IT and business related portfolios. · Provides a centralized repository to store important enterprise data. · Provides data collection tools that facilitate and manage the import of key information from a variety of existing applications and systems. · Supports the export of key data to 3rd party business intelligence tools or data marts for additional reporting. · Supports the ability to browse, search, edit and report against data stored in Troux’s centralized repository (Troux Source). · Provides the ability to cascade deeper into key reports to gain additional action-oriented details behind the summary values. · Built-in data stewardship capabilities support the ability to federate the management and maintenance of information assets on both an organisational and individual level. · Provides a powerful interactive and ad-hoc analysis engine for business analysts. · Library of preconfigured visualizations called ‘perspectives’ help decision makers quickly analyze and identify risk areas, as well as, opportunities for cost savings and investment re-alignment. · Supports the ability to perform data management and maintenance en masse against large data sets. · Provides a visual modeling environment to create models and quickly understand the connections and dependencies between portfolio elements. · Delivers rich visual models that represent the current state of organisations, processes, information, technologies and their relationships. · Supports scenario-based alternatives modeling and analysis of current to future state transformation. · Ability to create new objects and relationships in the Troux repository (Troux Source). Which Tool Vendors have you heard about? Which Tool Vendors tools have you used? 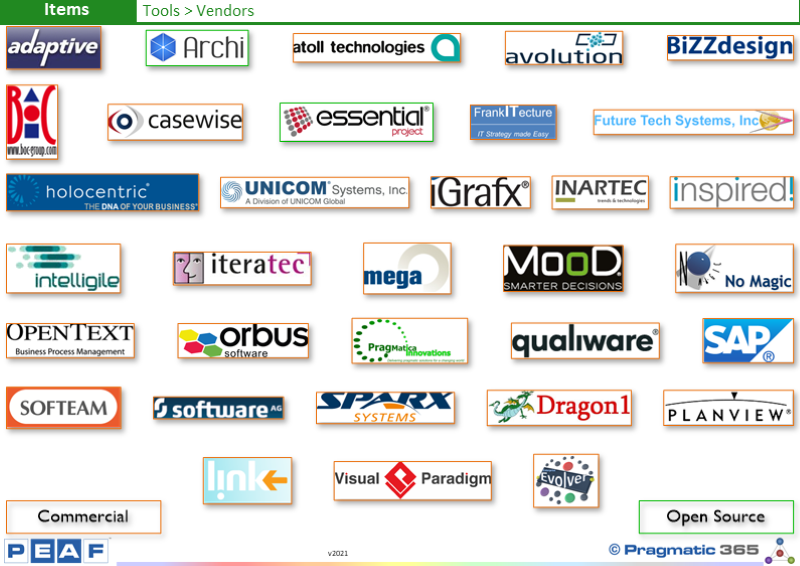 What is your view of each of these Tool Vendors?